Home > FAQs > Translation Prices > How much does French translation cost? Hello, I need to get some documents translated from French to English. How much does French translation cost please? There are quite a lot of them, about 200 pages I think but I’ve not counted all of them yet. The quickest way to get the lowest cost quote for French translation of your documents would be to scan and email them over, or send them via fax or even send the originals to our offices by courier. We’ll be able to give you a great price in just a few minutes. If you have a rough idea of how many words the documents contain then you can get an estimate of how much it will cost by using our on-line Instant Quote facility – however, please be note, the actual price you pay for your French translation is likely to be considerably less then this once we’ve seen the document. In the meantime I’ve explained how French translation charges are calculated so you can understand why it’s important for us to see the actual documents before committing to a price. How much do French translations cost? Translation companies classify languages into language bands as some languages cost more to translate than others. You’ll be pleased to know that French to English translations are in band 1 which is the cheapest band. The next thing is to look at is the number of words in the document you need translating from French to English. In the translation industry the documents you have in front of you are known as the source document (the translated document is known as the target document). We always charge for French translations based on the number of words in the source document as we consider it to be by far the fairest way. We need to know how many words are in the source document as we charge by the thousand source words. 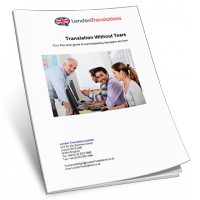 Don’t worry, we don’t expect you to count the words, we have special software which can do this very quickly which is one reason why we are keen to see a copy of the actual documents you need translating from French. As you’d expect, we offer volume discounts and given you have 200 pages of text we will be able to give you a generous discount on our standard per thousand words price. Our French translation discounts work on a sliding scale depending on how big the job is in terms of the number of words in the source document. The other reason why we are keen to see the documents before giving you a quote is so we can use our software to analyse them and look for repeated text and partially repeated text. You see most sizeable documents include sections of text which are the same or nearly the same and the good news is we only charge you a fraction of the full French translation price for these segments. For instance, if your document includes headers and footers which are the same or chapter titles which are similar, we can give you additional discounts for these. Of course we can only tell how much of your document contains repeats or partial matches (Sometimes known as ‘fuzzy’ matches) once we have a copy of your document so we can run it through our software. In summary, in common with all languages, we charge for French translation based on the number of words in the source document. Volume discounts and discounts for repeats and partial repeats can significantly reduce the per-word translation costs so please let us see a copy of the documents you need translating from French so we can give you our lowest quote completely free of charge and without obligation.